Well, I'm on my way to the airport. By tomorrow night, if all goes well, I will be in Oloron-Sainte-Marie, France. As I have said many times before, I do not like drafting posts while traveling and this time will not be any different. It is time to immerse myself into the Camino experience and let the outside world fade away. I am taking a journal and my camera like I did last time. I don't "write" in my journals really. They're more like notes and reminders of what I did that day, what I experienced, where I was, where I'm going, and how I felt - a disjointed bulleted list usually. Just enough, when combined with my photographs, to jog my memories when I start drafting posts back home. I know a lot of you like to follow my travels and I presume you are a little disappointed that it won't be live. This is no different than the last time. It will have to do. Last time there was a month delay in getting posts published since the Wife and I immediately left on our Route 66 roadtrip. That shouldn't happen this time. We have no trips planned until next Spring at the earliest. A week should be sufficient for me to recuperate and to re-enter the real world. Posts should start flowing soon after, I would imagine. I will be sending emails to the Wife like I did last time. She will share it with friends and family. For those wondering what my final pack weighs, it's 16.75 lbs (7.6 kg) without water. This is about 2.2 lbs (1 kg) more than I wanted. I think the extra weight is all in my toiletries. I guess I'm a high maintenance guy. Keep me in your thoughts. You all will be in mine. Two more days. For the past three or four days I've felt my nerves wind up. I am so nervous, excited, and anxious to go that I'm starting to get jittery. In an attempt to distract myself, the Wife and I went to the Omaha Healing Arts Center, Omaha's home of Yoga, Tai Chi, And other eastern arts. The center was hosting Tibetan monks from the Gaden Shartse monastery of southern India. While in Omaha the monks were providing blessings to homes and businesses. 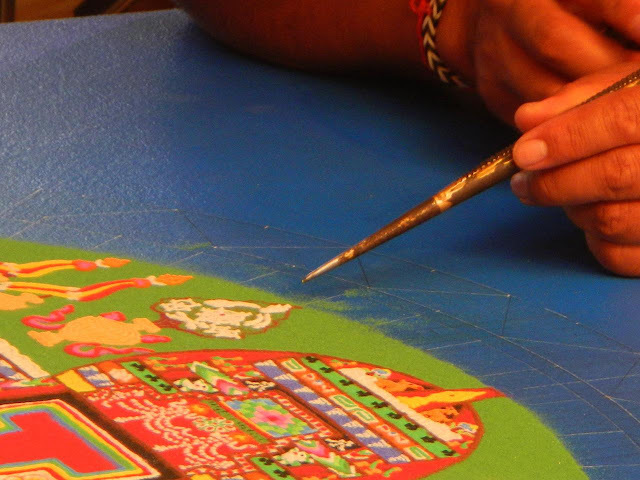 We were there to see the making of a sand mandala. The pattern is intricate and very labor intensive. The skill and patience is impressive to say the least. Pictures of the monks making the mandala can be found here. Careful placement of colored sand. We walked around taking pictures. They had different things related to their rituals - hats, horns (like the one we bought in Bhutan), and cloth mandalas - on display as the monks worked to recordings of chanting. We ended up purchasing a CD and a bracelet from the monks. 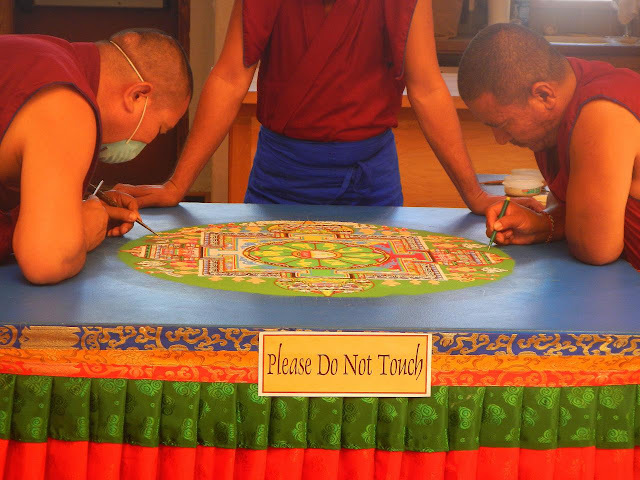 While observing the making of the Mandala and taking pictures distracted me for at least an hour, I have to say my nerves are right back to where they were and even getting worse. A while back I remember writing saying that I wasn't as nervous as I'd been my first Camino. I may have mentioned it a couple times. This week ... I think I'm cramming six month's worth of worrying into six days and no number of mandalas will calm me down. You know what it will take? A flight to Europe and 600+ miles of walking. That should do it. Our dog Iago, his full name is Santiago, is really ... special. Santiago is Spanish for Saint James. Saint James has an important history in Spain. Based on all the Camino stuff I've posted over the last few years you may know that there are a couple of incarnations of Santiago in Spain. There is Santiago as pilgrim. He is dressed in a simple robe, a hat, and carries a staff and a gourd of water. He is a peaceful pilgrim and dresses as his followers dress. The second incarnation of Santiago dates back to the reconquista, when the Spanish christians forced the moors off the Iberian peninsula. During the battle of Clavijo on 23 May 844 the legends says that Saint James appeared riding a white horse and helped the Spanish forces defeat the moors. From that point forward, Saint James became the patron saint of Spain and was called Santiago Matamoros. This name translates into Saint James killer of the Moors.